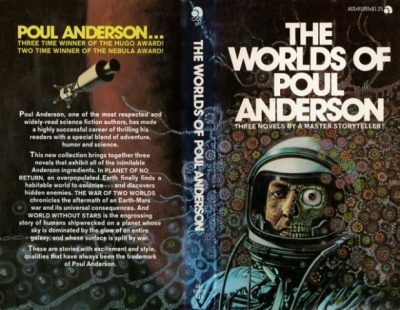 Poul Anderson’s 1974 omnibus The Worlds of Poul Anderson collects three short novels: 1954’s Planet of No Return (also published as Question and Answer ), 1959’s The War of Two Worlds, and 1966’s World Without Stars. Interstellar travel seemed to offer a way out of the endless cycles of war, tyranny, and revolution that have plagued humanity. Decades of exploration have turned up little to support dreams of new worlds for an old race. All of the exoplanets found to date are either uninhabitable or worse, already occupied. Civilized beings do not steal another being’s world! Troas appears ideal; it’s habitable and empty. There must be some snake in this Eden because Da Gama, the first expedition ship, vanished without trace. The second expedition is plagued by equipment failure and bone-headed staffing choices. Its backers are well-nigh fanatical about interstellar colonization, but the whole venture seems cursed. When the Henry Hudson finally reaches Troas, it finds serpents aplenty. Not just the expected environmental hazards, from floods to predators. There has been a terrible oversight: Troas has natives! But there’s an even greater threat to human ambition lurking in plain sight…. This is a relic of something I have mentioned earlier, the Twayne Triplet. In fact, I have reviewed Asimov’s contribution to this specific triplet, Sucker Bait .There does not seem to be a concise article for me to link to, so briefly: the Twayne Triplets were an early form of shared universe, each volume including three short novels with a common theme or setting. For a project that failed midway through the third volume, it’s well represented on my site. Anderson participated in a number of shared universes—Cleopatra, Thieves World, Harlan’s World, Murasaki—and it is not at all surprising to me he took part in the Twayne Triplets. Although Anderson pretty clearly favours humanity spreading to the stars, the story itself is equivocal about whether this would a good idea or if it is even possible. The economics of the enterprise are dubious; empty, useful planets are rare. I wonder if they are even possible, if we postulate a number of alien cultures with stardrives. If those vacant planets are colonizable, wouldn’t they have been colonized millennia ago by one of the numerous alien species we are told exist? I’m not sure that Anderson considered this, but it sure struck me. Modern readers will note a paucity of women in this novel, although we are assured they are given out like party favours at one government facility. There was no compelling reason for war between Earth and Mars. There was certainly no reason for what should have been a simple limited war to spiral out of control into a long, bitter, total war. After years of pointless carnage, Mars finally defeated Earth, leaving veterans like David Arnfeld no choice but to return to their ruined homeworld, to build what life they can under the eyes of their Martian occupiers. As David and his new love Kit Hawthorne discover, there’s more to the War of Two Worlds than simple misunderstanding and an unbelievably long sequence of poor strategic decisions. Unfortunately for the couple and their Martian ally Regelin, that forbidden knowledge is a death sentence! The front of the omnibus has copyright information for the other two stories but not this one. Perhaps it was rewritten slightly for the 1974 version? It’s still an oddly archaic story—Occupied Earth reflects late ’40s Europe—and its conclusion is almost perfunctory, as though Anderson suddenly realized his word limit was nearing. As well, there’s an unintentional subtext: “a great war orchestrated by a nefarious interplanetary cabal of rootless cosmicpolitans.” I don’t think Anderson meant this, but I cannot unsee the subtext. Try to avoid seeing it yourself.. Nevertheless, there are some interesting details. David and Kit’s meet-cute is extremely grim: unable to work, she decides to try her hand at prostitution. Of course David rescues her from this on her first foray into the streets. An odd narrative choice: sympathetic prostitutes weren’t all that common in old-time SF. Even tiny Mars is an entire world. Anderson makes offhanded reference to the several languages and cultures of Mars. Mars is only unitary from the perspective of ignorant Terrestrials. Most unexpectedly, this novel passes the Bechdel test —Kit and her daughter Alice converse about Alice’s dolls. If I had had to name a 1950s SF author whose work might have passed the Bechdel, Anderson would not been on my radar at all. Three thousand years from now, immortal humans have spread across the stars. Although even one galaxy is huge, larger than a million years of exploration could comprehend, the promise of contact with the enigmatic Yonderfolk, a newly discovered alien civilization located far out in the intergalactic depths, is too much for the crew of the Meteor to pass up. Meteor’s name is an ill omen: a navigation error leaves the Meteor a smashed hulk on a terrestrial world in the Yonderfolk’s home system. Salvation is only as far away as the Yonderfolk’s gas giant homeworld, but reaching that world seems impossible. The ship is wrecked, and a million kilometres might as well be a million light years. Hugh Valland is determined to get home to his beloved Mary O’Meara. In his favour: he and his crew are trapped on a habitable world, with helpful natives. Not in his favour: there are also gods and the gods disapprove of all that does not worship them. This is a very pre-Women’s Lib adventure story: men do all the exploring and the women stay at home, tending the kids. There’s one woman in this story who affects the plot significantly and she’s motivationally dead for the entire novel. That’s the big reveal at the end, the tragic twist: Mary died just as immortality became a reality. How she died does not matter. What does matter is Hugh spent the next three thousand years fixated on her. Anderson rejects 20th century convention in some ways: polyamory is the standard arrangement, at least for starfarers who may go decades between seeing their spouses, and there is even a (rather dismissive) admission that homosexuals exist. But I think it is more likely that the three books belong together because they all feature sects and cabals using secret knowledge to manipulate the surrounding societies. The cabals don’t mean to do evil: one believes that its actions are for The Greater Good, one acts as it does because it has no choice, and the third because its members sincerely believe that they are gods. Whatever their intentions, the cabals are the villains of each book. Planet of No Return is available here, under the title Question and Answer. Only to UK customers, I am afraid. The War of Two Worlds is available here. Also UK only. World Without Stars is available here.